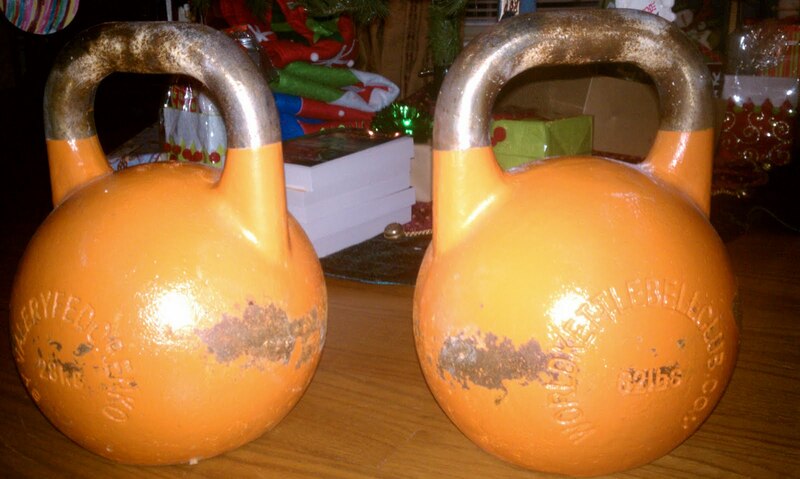 So I began this year with the plan to make the AKC's candidate for master of sport rank ("CMS") in Long Cycle with the 28kg kettlbells my wife and kids bought me for X-mas 2009. (See my post "The Great Pumpkins"). I put this plan on backburner in March when the District Attorney in my area announced his plans to resign and run for judge, giving me the opportunity to run for the DA position. The stress and workload of the campaign was too much for me to continue using the 28kg KB's as my primary training tool, so I returned to concentrating on the 24kg KB's for most of my workouts. I had some unexpected progress with the 28's, and then some more with the 24's. Eventually, the 12-16 hour days of the campaign were too much, and I had to drastically cut back on my volume and frequency. By the day of the election November 2, I had cut back to 3-4 days a week (down from 5-6) and was averaging only one 4-5 minute set of 2x24kg long cycle per day. During the month of the runoff, I sometimes used the 20kg KB's that I had all but abandoned. Since the runoff I have gone back to 5-6 days a week, and have increased my volume to pre-election levels. I'd like to reach CMS with the 28's by July, when I expect the Georgia State Championships will be held in Atlanta. I'd also like to reach CMS according to the IKFF's ranking table, which would mean 96 reps with 2x24kg KB's (the IKFF awards CMS rank using the 24kg KB's, which follows the traditional Russian system). In the meantime, I'll list a few milestones I reached during the year, listing date, weights used, total reps and rpms. I hope to have many more to list as the months go by. April 11 LC 2x28kg 6:00 48 reps. 8,8,8,8,8,8. July 25 LC 2x28kg 32 reps in 3:00. 11,11,10. August 12 LC 2x24kg 4:00 49 reps. 12,12,13,12. August 28 LC 2x24kg 10:00 93 reps. 10,9,9,9,10,9,9,9,10,9. My lockouts weren't great on the 10:00 set but I was proud of it given that I did it at 10:30 at night after campaigning for 12 hours. Since the runoff on November 30 I've completed a 2x28kg 55 rep 8:30 set and a 9:00 54 rep set. With regard to the election, although we made the runoff, we did not get the result we hoped for. Still, I'm proud of the job we did and honored and humbled by the support our campaign received. For now, I'm spending a lot more time with my family. I'm back at my old job, although I have a new assignment that allows me more time with my wife and kids. Below I posted a snapshot of my wife holding the X-mas gift my kids gave her this year. 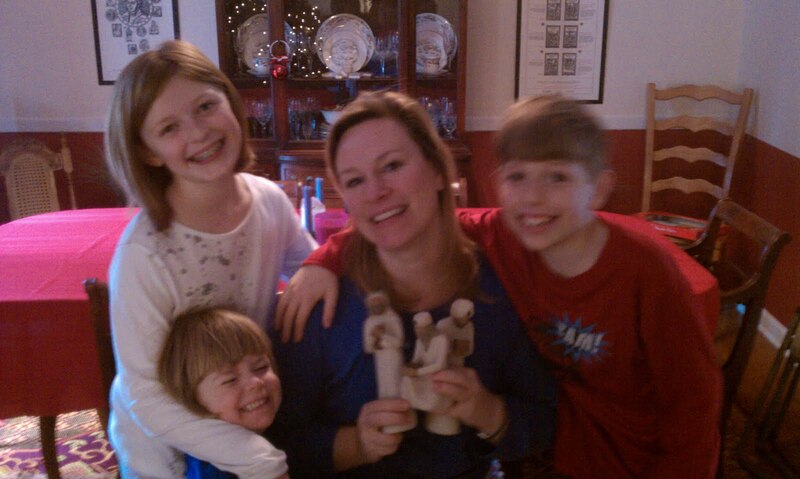 It's a set of sculptures depicting the three wisemen. I wish everyone a blessed and prosperous new year. God bless you all. Nice that your blog is up and running again. I think you will make the CMS. Afterwards you have to review what was harder, the WKC or IKFF rank (I guess WKC, but 10rpm w 24s is no joke). Sound great with the new work arrangement. Glad to see you're getting back into the full swing of things in training. Thanks, guys. I hope you are both doing well.